On this planet there are several types of cameras which we are familiar: a compact camera or point-to-shoot and SLR cameras that eventually became a DSLR camera because now fewer and fewer people carrying ordinary SLR camera using celluloid film. In the midst of developing a digital camera, it turns out there is very unique camera is a camera that pioneered less mirrors Olympus and Panasonic. Canon has not released the mirror less camera, but after a long awaited, Nikon finally decided to go jump in the world mirrorless camera, following the steps Olympus, Panasonic, Sony and Pentax more first born. 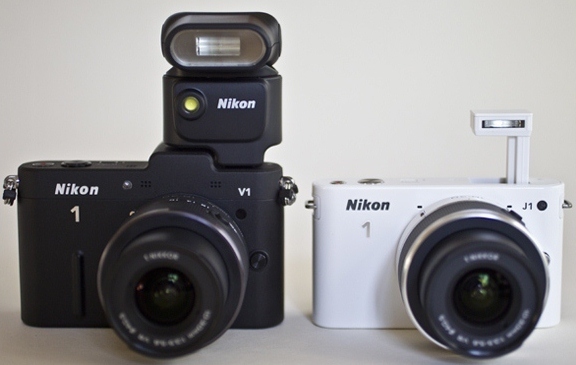 It dismissed the notion that Nikon will not want to make mirrorless camera because it was comfortable with the sale of their DSLR cameras.For the initial steps to launch two types of Nikon cameras that Nikon Nikon V1 and J1 with a lens that must be removed. Like what my opinion on something new? Find out more. 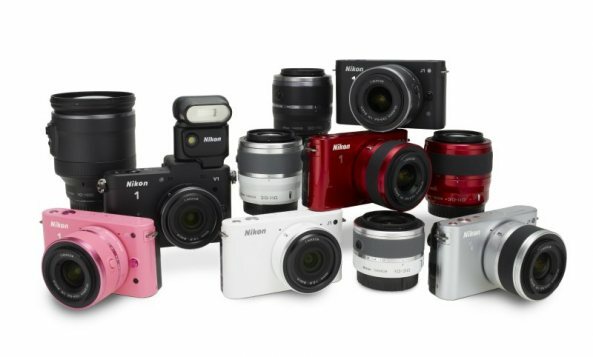 As we know, Nikon and Canon DSLR cameras is the market leader and all types of lenses. Competitors such as Olympus, Pentax or Sony was not much hope to win a lot of share in the DSLR segment. Even Panasonic's previous make any DSLR camera as reluctant to re-create a similar camera. Be similarity fate makes them (Olympus, Panasonic, Sony, Samsung and Pentax) choose to compete in other segments, namely mirrorless camera (whether in the future either Fuji or Kodak film will come following a similar move). Canon and Nikon were constantly pressured from all directions. Competitors who make the cameras start to affect the level of sales mirrorless DSLR Nikon and Canon. On the other hand, Nikon and Canon fans pressing Nikon and Canon to create a mirrorless camera in order not to lose face.Though Nikon or Canon cameras are well aware that making mirrorless will only make the situation more complicated. Finally, Nikon decided to try a new luck with drafting a new mirrorless camera system that is unique and makes a lot of pros and cons between the photographer (apparently still more the cons). Though different from other brands (eg Sony), Nikon will probably not make mirrorless camera that is as good as their DSLR. So that's the case is the birth of a camera system with a small sensor, it is still smaller than the Micro Four Thirds cameras and unfamiliar new crop factor of 2.7 x. Before discussing the Nikon A1 and V1, I want to say my opinion about the Nikon 1 in general. From initial concept mirrorless camera is aimed to be an alternative to large and heavy DSLR.So it remains a mirrorless camera system camera with a lens lineup specially designed for it. As for the affairs of the sensor is used, the originator of this type of camera is still maintaining the quality of the same photo with a DSLR, so that the sensor used is the same size as a DSLR. Panasonic and Olympus Four Thirds sensor wear, even Sony and Samsung use APS-C sensor. As a result generally mirrorless cameras have large sensors have two advantages: high ISO noise and safety of a beautiful bokeh. The surprise comes when all of a sudden Pentax introduces the Pentax Q mirrorless camera that uses a small sensor, the size is exactly the same as a pocket camera. Step Pentax reap a lot of criticism and also leaves many questions why Pentax to do just that. Hard to believe there will be people who want to buy an expensive camera body, with a wide selection of lenses just to get a picture with mediocre results. Nikon comes to filling a gap between mirrorless sensors Four Thirds cameras (large sensor) and Pentax cameras Q (small sensor). From the selected sensor size Nikon, produced a new crop factor of 2.7 x CX named Nikon lenses so as to obtain a focal range 28-80mm lens Nikon should make a very wide which is 10-30mm. Whereas the Four Thirds camp has 2x crop factor makes it difficult for wide lens. So CX format is indeed more suitable for tele focal range, which proved a telephoto lens equivalent to 80-300mm quite realized by making 30-110mm lens alone. Advantages Nikon sensor 1 is allowed to be made rather small-sized lens, like the picture above. Compare with Sony NEX format that lens alone is huge. Nikon sensor size 1 which is larger than a pocket camera sensor (see picture above) can bring other benefits that should be able to give results that are relatively clean images from ISO noise in the medium (up to ISO 400). At least ISO 800 can be used if forced, with a noise that can still be tolerated. For comparison, compact cameras will begin to noise at ISO 200, while the noise DSLR cameras start at ISO 800. But the Nikon sensor 1 is still insufficient to get the impression the photo or name bokeh background blur, even though using a large aperture. Then for whom this mirrorless Nikon makes the camera? Basically it's not easy to ask the photographer to switch from DSLR cameras mirrorless. The main reason is that even mirrorless camera prices are still more expensive than DSLR cameras. Another reason is the lack of lens choices and not everyone is willing to leave the comfort of peering through the optical viewfinder. Nikon are well aware of it and from the beginning does not target the lovers to have a Nikon DSLR Nikon 1. Nikon DSLR aimed at those who like photography to class pro photographers, Nikon is better positioned as a gap filler between the pocket and DSLR cameras. So I conclude that the Nikon one will be liked by those who do not want to have a DSLR (probably because of its size or because they do not want a headache choosing the lens), those looking for a small camera lens can be removed but the results still meet the standards, or those who want to have a camera equally good for photos and video while remaining easy to use (point and shoot). Everything is back to the market and competition in the market who will determine whether the Nikon one will succeed or fail. With the sale price, we can choose a DSLR like the Nikon D5100 kit or other mirrorless like Lumix GF-3 or the Olympus E-PL3. Competition will be tight, but Nikon is not without preparation for the plunge in this new world. Nikon even has prepared a variety of lenses and accessories specifically for this format. Even if Nikon one will fail, at least Nikon has tried. What about the attitude to be taken the mortal enemy of Canon Nikon namely, whether daring to make a mirrorless camera or simply enjoy the best-selling series The popular Canon EOS and compact cameras are also very popular lovers of photography? If you do not like carrying a big heavy camera, the camera like the Nikon A1 or V1 this is the right choice, but less mirror cameras from Olympus, Panasonic, Pentax or Sony and Samsung maybe you can compare before you make a decision.